Some reader reviews and testimonials of “TurnKey Publishing”. The Author who Inspired Me! After reading this book my world was transformed! I have wanted to be an author for many years, but as soon as I walked into a bookstore I became discouraged by all the many, many authors and titles already out. I kept questioning myself and my ability. Why would any publishing company give me a chance? How can I get a publishing company to read my manuscript and cut me a deal? Well, these questions went out the window as soon as I read Matthew Chan’s well organized, to the point, and easily explained way to create my own publishing company and market my own books. As I turned the last page my head was spinning with new knowledge and my heart was pounding with future possibilities and ideas. This book explains, step-by-step, the road I needed to take to start my own publishing company. And throughout the book, the author’s personal experiences and words of advice makes the reader feel like he or she is sitting down with an old friend over coffee and getting advice about a new venture in life. I recommend this book to anyone who has ever written a book and received a rejection notice. Go now and dust that manuscript off and place it on the table next to your easy chair and then open up a copy of TurnkKey Publishing, grab a notepad and pen, and let your future begin to brighten! The sky is the limit. Finally the Simple Truth! And talk about Perfect Timing! For those of us who are feeling the crunch of the current poor economy this book couldn’t have been released at a better time. When I first started reading TurnKey Publishing I really didn’t believe that it was going to provide me with usable information on how to actually create a new business or give my current business a real boost. Boy, was I wrong. This is perfect timing – I do some coaching and speaking and it’s a well known fact that if you have some books to sell you are automatically elevated to that of an expert in the “eyes of the public” lending itself to more jobs and the best part – higher pay. Matthew Chan has not only given us the “inside scoop” on how to publish your own books and how things work in the publishing business, but he has laid it out in a way that is simple, easy to understand and walks us through step by step! It’s like having my very own personal coach by my side. This has turned out to be a very encouraging read, not only does it provide us with the “how to’s” but what I also found equally important to me were the “Why’s:. Why is it important for me to write my book(s) in the first place. As Mr. Chan states in his book, “Done correctly, every author brings positive energy and influences to the greater whole.” This statement changed everything for me – the excuses are gone, the easy to do steps have been given. Thank you Mr. Chan for not keeping the “publishing secrets” you have learned and experienced to yourself. Thank you for choosing to share it with the greater whole. I am grateful. Great book to all want-to-be-authors! Awesome book! And it couldn’t come at a better time for me. I been wanting to become an author on “How to” books just like Matthew Chan. Yet, I been scared and afraid to take the steps to start writing and publishing my first book. Reading Chan’s book immediately provided me great insight in the independent publishing. The book also provided tips on how to start “Writing Your Book” as Chan spent the entire Chapter 4 on this topic. I am happy to report that after reading that particular chapter, within two weeks, it inspired me to write six chapters for the book I plan to publish later this year! I like the details and insight, the author provided during his 6 years of running Ascend Beyond Publishing and how he wrote and published over a dozen titles. Chan shared his experience and lessons learned. Chan is a great story teller. Through the book, readers will learn, 1) benefits of independent publishing, 2) business side of publishing, 3) forming your publishing company (if you desire to do so), 4) writing your book, 5) pricing your book, 6) designing your book, 7) printing your book, 8) marketing your book, etc.. 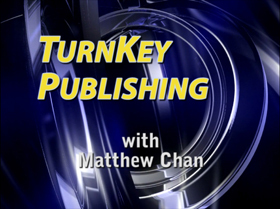 I highly recommend TurnKey Publishing for anyone who is ready to take action and start writing and releasing his or her first book through independent publishing. Thank you Matthew for sharing the insight and secrets. And watch out, world, you will see my first book on Amazon.com for this holiday! Matthew Chan has done it again! I’ve been a follower of Matthew’s since his first book and have always been impressed with the quality and professionalism of the author and the content he provides. Due to changes in the economy, I decided to make a move into the world of Information Publishing in an attempt to create another source of income. I knew a little bit about information publishing, but the simple truth is I just didn’t know enough. I looked around the internet and never really found a book that I thought would be a good fit. I ran across a few e-books, but I really wanted to find a good quality physical book on Publishing. Well, as it turns out my favorite Real Estate author decided to move into the world of helping people become publishers with his newest book series, Turnkey Publishing. The same system he used and uses to create his many real estate titles. I have always found his other books to be excellent so I made an investment and it’s paying off. 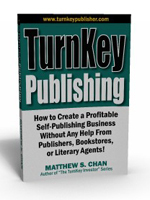 Turnkey Publishing is more than just a book on how to publish your own books with publishers or agents. It’s a complete guide in the sense that Matthew opens his doors and shares his insights on the subject as well as his system for turning out multiple titles in a short amount. Matthew also shares his views on running a self publishing company and the system behind it which were quite helpful. I felt I was getting a more complete education in the sense that he was showing me step by step how to become a publisher and what to do with the book once completed. One of the most helpful parts of the book for me was his section on resources such as where to get the book created, distribution, websites and etc. One more interesting side note is that Matthew’s book isn’t just about becoming a publisher. His book also takes you behind the scenes of his operation and he shares the system he uses to produces more than one title a year which allows for passive income over and over. I also picked up the second book in the series entitled “The Turnkey Publisher’s Audio Publishing Handbook.” While this book isn’t as thick as the first in the series I found this one more interesting in the sense that it opened me up to an idea I never thought of which was creating audio programs. So instead of just having books I could also have audio programs as well. All in all I’m quite happy with my purchases and look forward to the next book in the series. It’s nice to know that same authors still believe in providing quality and value. This amazing book has inspired me. But most important of all, it has empowered me. I consider this book one of the better ones on self-publishing. Chan writes in a down to earth style that conveys the subject matter well. He tackles a lot of subjects that are merely skimmed over in other books on the subject. He says that ‘…a safe genre of self-publishing is ‘how-to’ books”, and it’s easy to see that he has mastered this genre. Matthew has done it again. Not conforming to traditional beliefs and breaking down the walls of publishing myths, Matthew has simplified the process of getting a book published and we can all get on the fast track of self-publishing a book from the hard work and research he has done. No longer is seeing your work in print only for the famous established author or for the person who can pay for a big publishing company. If you have ever wanted to birth a book that has been in your life, now is the time and this book will save you tons of time and money.